Tough day yesterday as more cats passed away from illnesses never treated. A vast majority of the 700 cats are very ill, requiring expert medical teams larger than I have ever seen. We have two main teams here - a sheltering team responsible for daily feeding and cleaning. The other team is the medical team responsible for examining all cats as they entered the shelter and then providing daily treatment and evaluation in the effort of saving lives. Our amazing International Fund for Animal Welfare teams have spent two weeks so far serving on both teams. I am serving as a shelter manager since leaving the crime scene of Caboodle Ranch. I now manage the daily care for these beautiful cats. 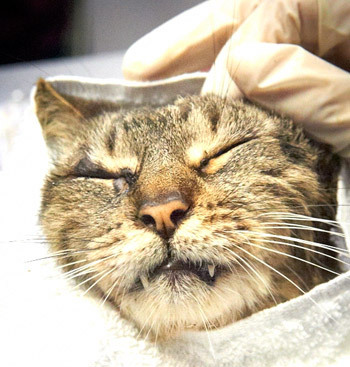 That also means that I am the one who must alert the medical team when we observe the hundreds of cats suffering from lesions and congestion so severe that they struggle to breath or move. We know so much of what we see could have been prevented with proper care that it breaks our hearts to know it may be too late for so many. We have behaviorists here that have introduced fascinating toys and vertical structures for the cats and we see the difference it makes in their lives as they continue to eat well and receive the medical treatment they so desperately need. They have outdoor runs where they can enjoy the sunshine and slight Florida breeze as they heal inside and out. Cats, like any other creature, employ their unique method of communication - they welcome us each day with meows, head rubs against our arms, and when we hold them gently to wipe their eyes and nose, they look up through glassy eyes to say thank you, I just know it. I am so proud to be leading this IFAW team on this journey to save these cats in crisis. The investigation is solid and the evidence overwhelming - I can only hope that these cats will receive justice sooner rather than later. People who have relinquished their pets to Caboodle Ranch who would like to leave information about their pets can do so at the number and email provided below.